Spaghetti squash is a vegetable known for its stringy, crisp consistency. You don't need to mash this type of squash. Instead, you can heat this vegetable, and use a fork to separate the strands to create a type of vegetable noodle. Spaghetti squash is rich in nutrients and low in calories and carbohydrates, which makes it healthy and well-suited for many different types of weight-loss diets. Spaghetti squash is a nutrient-rich food filled with vitamins, minerals, fiber and antioxidants. It has few carbohydrates and is low in fats and protein. Spaghetti squash calories are also low and total just 42 calories per 1-cup cooked serving. An average serving of spaghetti squash also has 9 percent of your DV for fiber and contains trace amounts (between 1 and 4 percent) of most other essential vitamins and minerals. This vegetable also contains healthy fats, like omega-3 and omega-6 fatty acids. There are many different types of spaghetti squashes, so you should know that there may be some variation in nutrition among types. 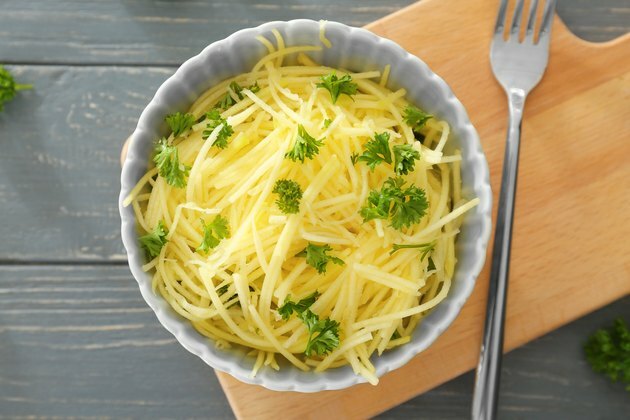 Spaghetti squash's nutrient-rich content, low glycemic index, low calories and its minimal amount of carbohydrates make it a particularly popular choice for people following low-calorie or low-carb diets. Since there are only 7 grams of carbs in spaghetti squash per serving, this means that this vegetable is well suited for a variety of different diets, including low-carbohydrate, ketogenic and paleo diets. Spaghetti squash is a type of food that is often recommended, even for very strict diets. This squash is even suitable as a component of anti-inflammatory diets as it can help reduce symptoms of inflammatory bowel disease and irritable bowel syndrome. The varied benefits of spaghetti squash make it a particularly healthy choice of vegetable, and these are just the positives associated with consuming this vegetable's pulp. If you're not following a specific diet, you can also eat the skin, which is even richer in fiber and good for the health of your digestive system. You can also consume the seeds of spaghetti squash, which contain various other bioactive compounds. Spaghetti squash, a variant of winter squash that's also called Cucurbita pepo, is from Central America. These days, spaghetti squash is grown and consumed worldwide. It can be found in the form of different cultivars, like Orangetti or Hasta la Pasta. Many squashes are orange in color, both inside and outside, and some might even be confused for pumpkins. However, spaghetti squashes are cylindrical in shape with a light-colored exterior. Their insides come in a range of orange or cream colors, depending on the cultivar. You're most likely to confuse spaghetti squash with butternut squash when they're both whole and uncooked. Based on their nutrient content, these two types of squashes are very different: Butternut squash and other types of squashes typically have a lot of vitamins A and C, while spaghetti squash tends to have only trace amounts of these vitamins. However, there are many types of spaghetti squashes, and the ones that have darker-orange tones are typically the ones with more of these nutrients. You're unlikely to mistake spaghetti squash for any other type of squash once you cut into it. It's unique in that its flesh forms crispy strands that look like thin spaghetti. Cooking squash and similar vegetables, like pumpkins and sweet potatoes, is fairly simple. Most people roast them or use cooked purees to make sweet or savory pies. Like these other vegetables, spaghetti squash can be roasted, steamed, sautéed and fried. However, you'll find that, due to its stringy texture, this type of squash is not ideal if you're keen on making purees and soups. The unique interior of spaghetti squash requires it to be cooked slightly differently than other vegetables. Once you've heated your spaghetti squash sufficiently, you'll need to rake its pulp in order to separate out the thin strands of the flesh. Once separated, these strands need no further cooking. You can easily top them with a pesto or Bolognese sauce or eat them along with your favorite type of protein. If you're not going to use an entire spaghetti squash once you've cooked it, you can freeze and store the remainder. Just make sure to remove the seeds, cool it down and rake out the strands before doing so. Otherwise, your dishes may end up having an unusual consistency. Alternatively, you can add them to stir-fries, fritters or any other dish and store the whole meal instead. The IBS Network: What Are FODMAPs?